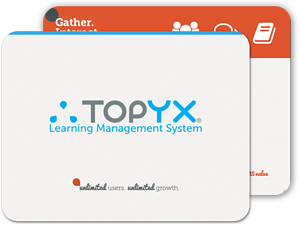 "TOPYX is an engaging learning management software that truly works "
Content creation - Easily build learning and development programs. SCORM & Tin Can API- Interoperability support with xAPI, LRS, and LTI. Social learning - Share announcements and events in a collaborative online space. Mobile learning - Create and browse learning content on your mobile device or tablet. E-commerce - Monetize and deliver your curriculum to a wider audience. Language packages - Support a global workforce with language localization. Reporting - Communicate easily and intuitively with teams through statistics and reports. Download the full platform overview to gain a deeper understanding of the many other features that the TOPYX LMS offers.